Staged repair of bilateral cleft lip, closing one side first and the other side at a later date was advocated in earlier times to avoid wound dehiscence or spreading of the scar because of tension over a protuberant premaxilla. With this approach, nasolabial asymmetry was almost unavoidable [Figure 1]. Staged repair is still used by many surgeons who do not use presurgical orthopedic alignment. 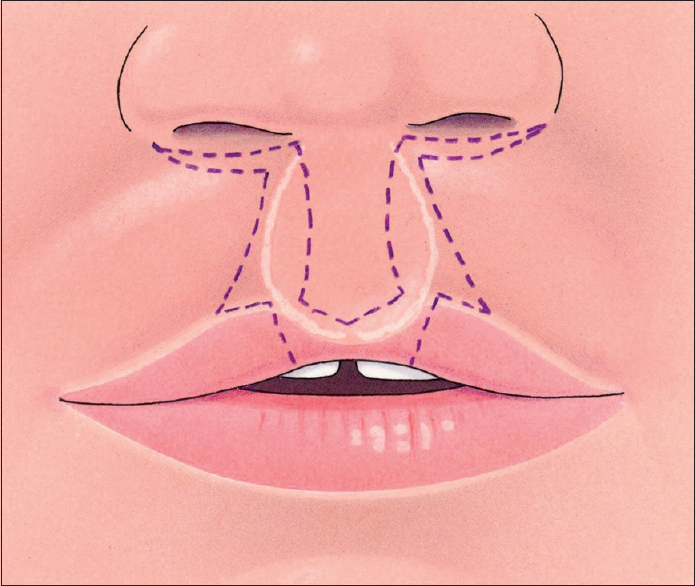 Other surgeons perform synchronous bilateral repair after early orthopedic repositioning of the premaxilla, using a straight-line lip repair (“Veau III”) without muscle reconstruction., This procedure preserves nearly all of the prolabial skin and patchy vermilion and results in a wide central segment without a white roll, a lateral “orbicularis bulge” on smiling and whistling, and a tethered oral sulcus behind the prolabium [Figure 2]. The central segment will not grow vertically; it will widen during infancy and remain unchanged during the pubertal growth spurt [Figure 3]. 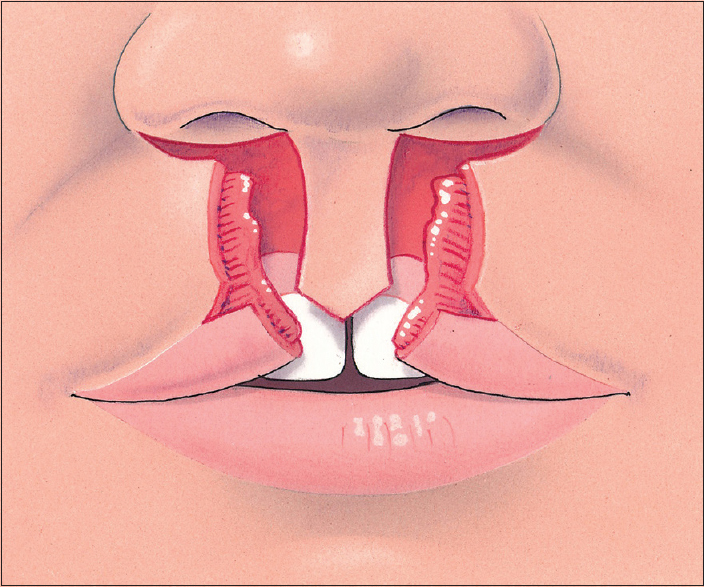 This strategy, which was common in the first half of the 20th century, was used by surgeons who were concerned about a tight upper lip after resection of the entire prolabium (and premaxilla) [Figure 4]. In patients, who desire revision after unsatisfactory primary bilateral cleft lip repair, we use the following technique. 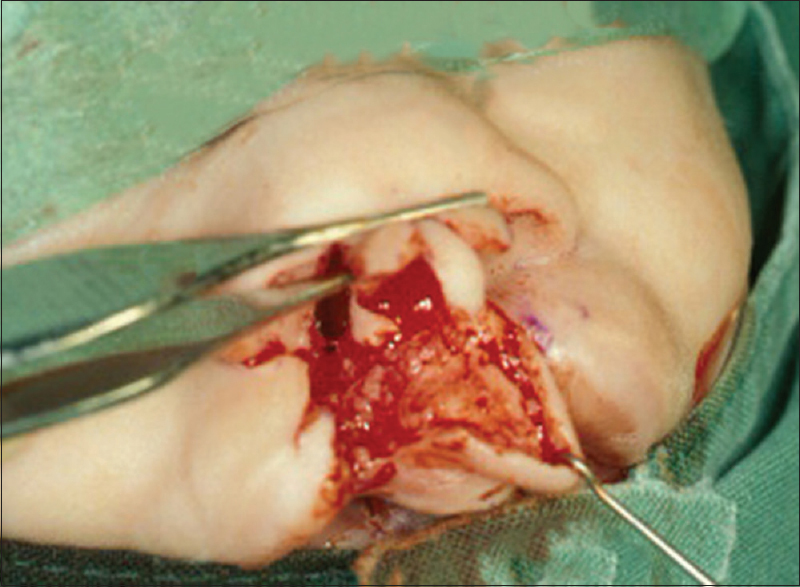 The skin and mucosa incision designs are essentially the same as the designs used when performing primary repair after a lip adhesion procedure and presurgical orthopedic treatment [Figure 5]. Indeed, the situation is as if the initial surgeon performed bilateral lip adhesion (staged or synchronous) and offered this procedure for primary definitive lip repair. A central philtrum plastron is marked; its tip may have curved or straight edges. The lateral red lip segments are mirrored, using the narrower segment as a reference, while keeping the segments as wide as possible. The height of the vermilion is equalized on both sides with respect to the distance from the free border to the white roll and from the red line to the white roll. 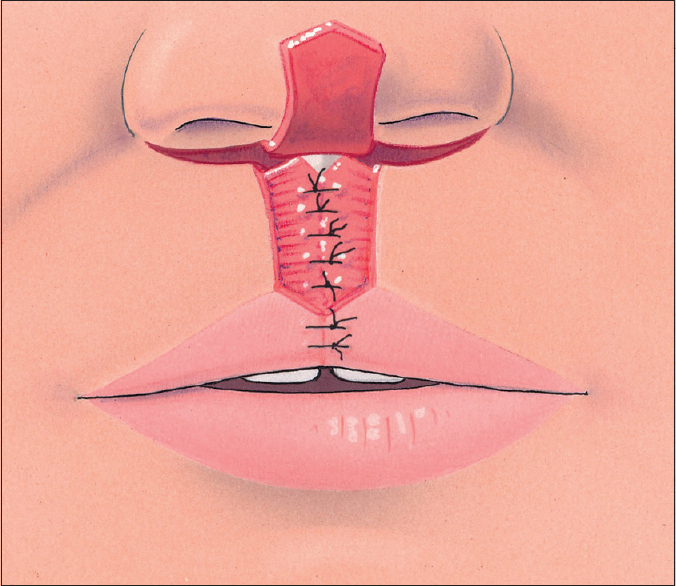 The incisions above the white roll equal the edges of the plastron/philtral flap tip in width and free up the medial white roll-vermilion-mucosal flaps so they can be united under the philtrum. Subtalar wedge excisions are necessary to avoid the upper lip becoming excessively long [Figure 6]. The skin scars, embryonic undifferentiated mesoderm in the midline, subtalar wedges, and parakeratinized central vermillion are discarded, but the prolabial nonkeratinized mucosa behind the red line and in front of the gingiva is retained [Figure 7]. Bilaterally, the peripheral and marginal muscle orbicularis and nasolabial muscles are freed from their skin, mucosa, and bony attachments [Figure 8]. The nonkeratinized mucosa in the midline is stretched over the denuded periosteum of the premaxilla and centrally sutured to the periosteum covering the nasal spine [Figure 9] and [Figure 10]. The mucosal edges of the lateral lip segments are joined in the midline [Figure 11] and create an oral sulcus, which can accommodate an orthodontic appliance. 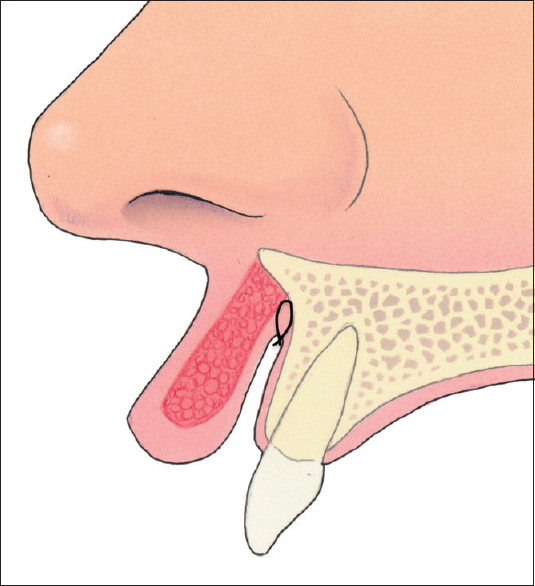 The United muscle stumps [Figure 12] help achieve normal movement of the central lip. Rounding for vowels and proper positioning for bilabial (p, b, m) and labiodental consonants (f, v) becomes possible. The mouth can be closed, which helps prevent gingivitis. Whistling also becomes possible. 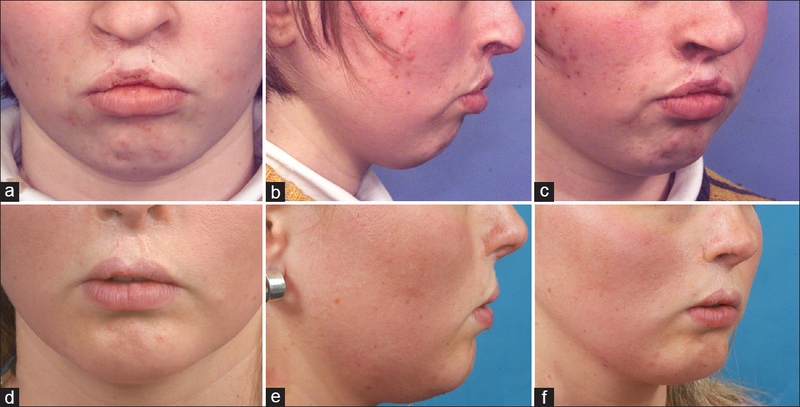 The resulting scars are minimal and hidden in the alar-facial groove or border the aesthetic units and mimic ridge transitions (white roll and philtral columns) [Figure 13]. The vertical scars become white and mimic light reflections on the philtral ridges. The lateral bulges disappear, and the lip becomes more pouty. Salient aspects are the central cupid bow morphology, height of the lip in relation to tooth exposure on smiling (the incisors often have cervical enamel lesions), and functional lip width and suppleness. Nevertheless, the greatest challenge persists–the creation of a median tubercle. Often the central vertical scar in the sulcus and vermillion mucosa contracts and acts as a curtain cord. Furthermore, the marginal orbicularis oris muscle stumps are often difficult to distinguish, dissect, and suture. This is a retrospective observational cohort study comprising all of the first author's secondary lip correction cases between 1991 and 2018. The records of 21 patients (13 males and 8 females) were compiled for analysis. All patients underwent primary lip repair (Manchester or Veau III) at other institutions. The mean age at reoperation was 17 years (range, 9–39). Follow-up photographs were taken at a mean of 3.5 years (range, 1–13) after reoperation. After obtaining informed consent from the patients or their parents, we created a questionnaire for each patient containing photographs before and after the reoperation, as well as a list of research questions [Figure 14] and [Table 1]. Two surgeons independently completed the questionnaires; one was a PhD student conducting research in outcomes of primary cleft lip, alveolus, and palate surgery (AT), and the other was an experienced cleft surgeon (NL). 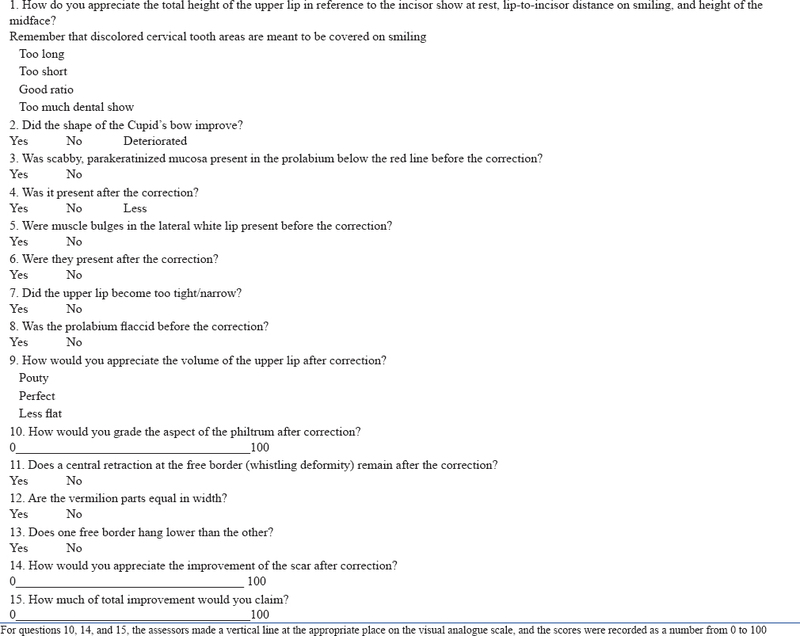 The questionnaire results are shown in [Table 2]. 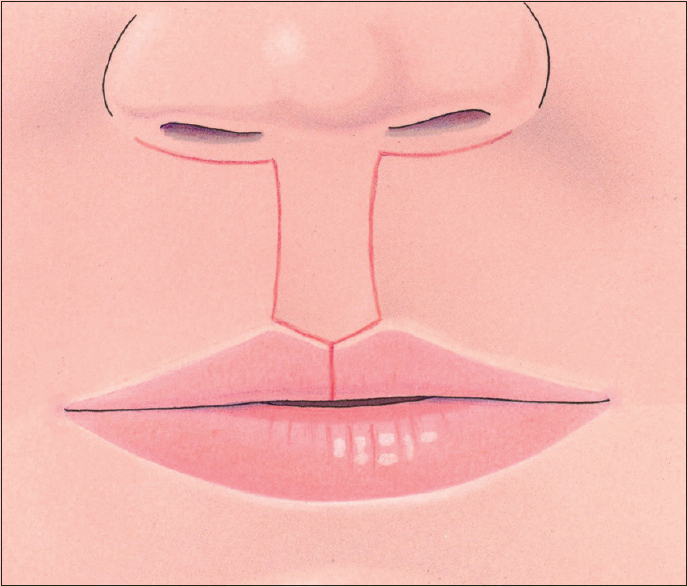 The Cupid's bow shape improved in 81% of patients [Figure 15]. Scabby mucosa could not be eradicated in all patients [Figure 16]. Orbicularis oris bulges responded well to muscle reconstruction, from a mean visible score of 33% before reoperation to 10% after surgery. 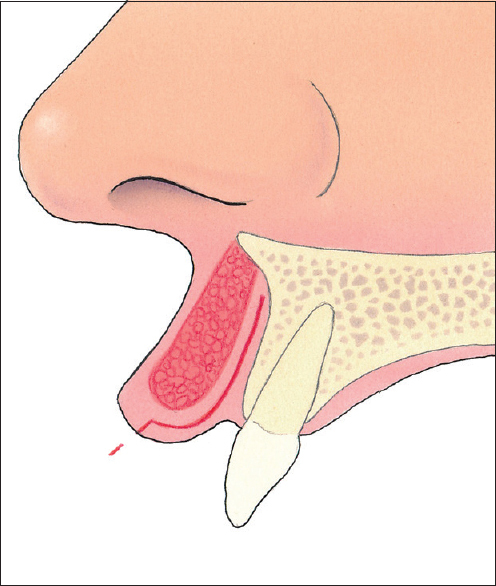 The assessors agreed that the lip became too tight in 57% of patients [Figure 17]. After surgery, the upper lip was judged as pouty in 14% of patients [Figure 18] and perfect in 52% of patients. 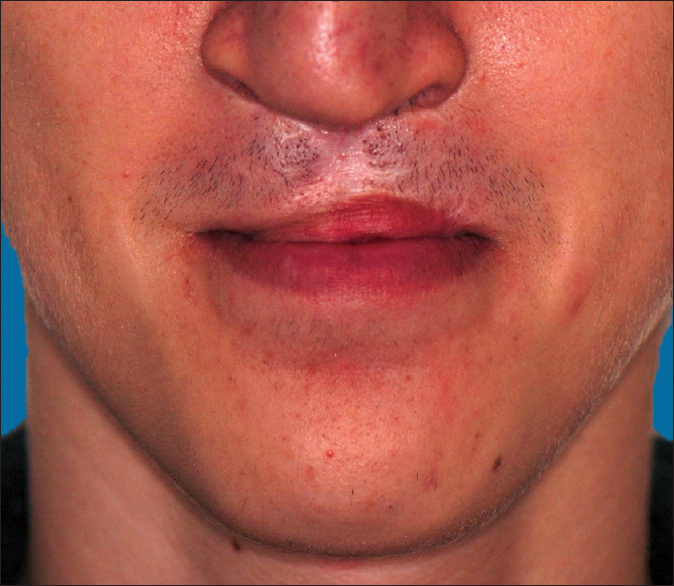 In contrast, the upper lip was judged as too flaccid in 33% of patients before surgery. The philtral elements were graded as79.5 on a visual analog scale (VAS) after reoperation [Figure 19]. The VAS improvements in scar and overall appearance after reoperation were 78.8 and 82.0, respectively. Adolescents and young adults with the stigma of a distorted cleft lip suffer from low self-esteem. However, even today, many European cleft centers do not offer primary orbicularis oris muscle reconstruction when dealing with bilateral complete cleft lip, alveolus, and palate. Parents tend to be content with what has been offered in the first year of their child's life, and cleft surgeons tend to disregard the lip deformity during consequent palatal and alveolar repairs because they created the deformity themselves. Often the lip receives no secondary attention until the child becomes a self-conscious member of society or the family moves to another geographic location and meets another cleft team. A plethora of surgical techniques is utilized to repair secondary bilateral cleft lip deformities. However, the principles are well established: symmetry, muscle continuity, proper philtral size and shape, and an adequate median tubercle. Kinnebrew mentioned that an Abbé flap is only indicated in selected patients with a significant cleft lip deformity. Indeed, the vast majority of patients with bilateral cleft do not require an Abbé flap to correct their secondary deformity. Subtalar wedge excisions avoid inappropriate lengthening of the lip. The initial fear of producing a too-short lip is a reflex persisting from the primary surgery. A long lip is aesthetically less pleasing than a short lip, especially in women. In patients with bilateral clefts, the lateral incisors are often missing, and central teeth are frequently discolored. The marginal gingiva is usually very irregular in contour and may exhibit persistent inflammation and scars. Careful height adjustment of the free lip border is mandatory. A peaked tubercles is impossible to create using our technique. Central notching, however, can be corrected by a Z-plasty in the labial mucosa. Residual nonkeratinized mucosa below the red line can be replaced by keratinized mucosa of the lower lip using a simple full-thickness graft. The proposed technique for secondary correction is the same technique the authors (MM and NL) utilize for primary repair of the bilateral cleft lip at the age of 4 months. Patients with secondary deformities presenting for reoperation can be considered the same as children who have undergone a nasolabial adhesion procedure, but not received second-stage surgery at the appropriate age. Veau V, Borel S. Division Palatine: Anatomie, Chirurgie, Phonétique. Paris: Masson; 1931. Nagy K, Mommaerts MY. Lip adhesion revisited: A technical note with review of literature. Indian J Plast Surg 2009;42:204-12. Mokal NJ, Desai MF. 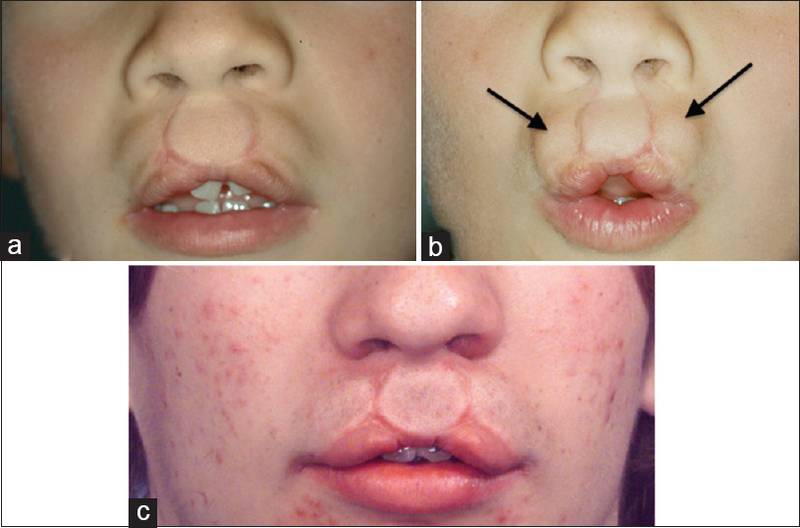 A novel technique using a subcutaneously pedicled islanded prolabial flap for the secondary correction of bilateral cleft lip and nasal deformity. Indian J Plast Surg 2017;50:251-9. Kinnebrew MC. Use of the abbé flap in revision of the bilateral cleft lip-nose deformity. Oral Surg Oral Med Oral Pathol 1983;56:12-9. 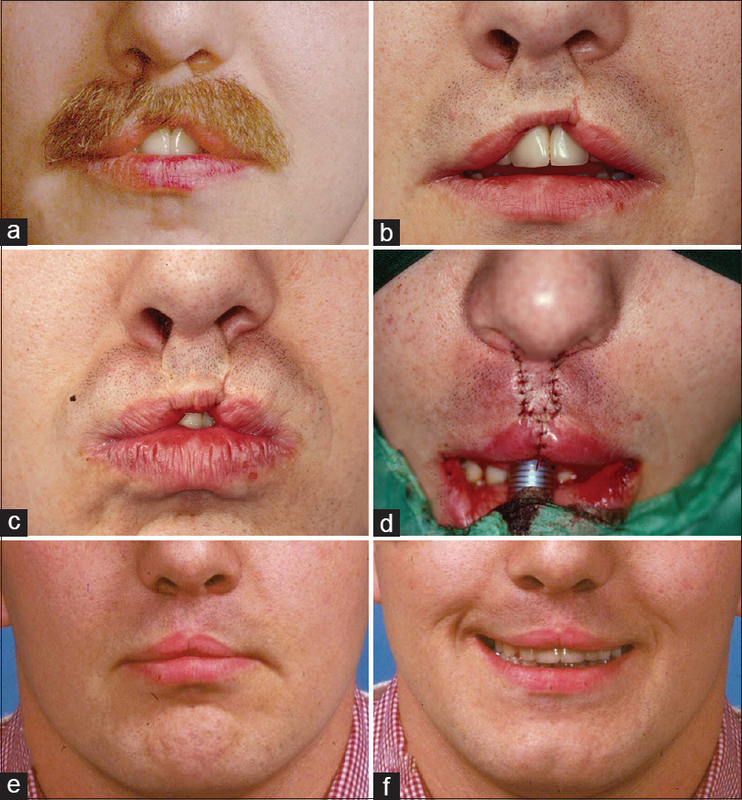 Stal S, Hollier L. Correction of secondary cleft lip deformities. Plast Reconstr Surg 2002;109:1672-81. Mommaerts MY. Cleft lip vermilion: Below the red line. Br J Oral Maxillofac Surg 2018;56:561-2.